i had the pleasure of revisiting reef recently. the impetus was a review of the beet ravioli that misha wrote last month. it was as good as he said and i urge you to get a 'tasty bit' before beets go out of season. beet ravioli. the beets are actually served WITH the ravioli, not stuffed inside, in a rich buttery sauce. beet puree lends some acidity. peppery watercress crowns the dish and makes the dish taste and feel more summery. the ravioli are filled with beet greens and ricotta cheese, a lovely contrast to the natural sweetness of the roasted beets. rainbow runner 'never served before in texas' sent to the table by chef bryan caswell who you can pinpoint easily in the kitchen by his orange 'stros cap. but i had to break it to him when he came by the table that i actually had the same fish the night before. chef randy rucker served cured rainbow runner at the tenacity dinner the night before and credited caswell for scoring the rare protein. the fish which are apparently very hard to catch was mild, silky, and fantastic. caswell served the rainbow runner raw with paper thin cucumbers in a small pool of yuzu. the plate was brushed with a sauce made from something fermented and japanese. it was reminiscent of thai flavors with delicate hints of curry. it tasted as beautiful as it looked. crispy skin snapper, reef's signature dish, was even better tonight than i remember. i can still taste the aromatic caramel-y brown butter flavors. i am predictable in that i will order anything on a menu that is advertised with crispy skin. this dish is one of the best. grilled sea scallops over truffled polenta. HUGE scallops, perfectly grilled. good dish but not a whole lot of excitement. could amp up the truffle flavors. 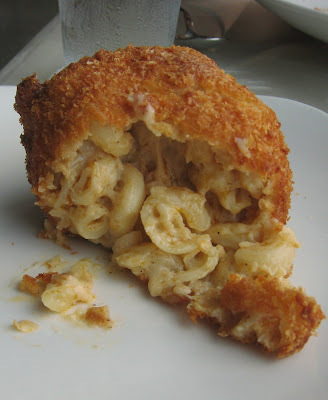 fried mac and cheese comes to the table like a croquette fit for a giant. it's just as good as it sounds. milkshakes no minor. i'm not much of a dessert person and my dinner companion, the very awesome A., turned down the dessert menu. these shots were also sent to us from the kitchen and were very much enjoyed and appreciated. the size was perfect for me. the chocolate straw is tastier than it is functional. the wine: a refreshing, crisp laurenz V. 'charming' gruner veltliner, an austrian white wine in the same vein as sauvignon blanc, sancerre, and albarino. $27 a bottle. reef's wine selection is incredible and prices have such low markups that picking a wine is almost as fun as drinking it. this bottle retails for $25 at spec's. Food pics look great today. I wanted to eat my way through your post today. @ food princess and sheeats - thanks! @ peggy - our fried mac and cheese wasn't dry at all. it would have been better with a sharper cheese though. Those pictures make my mouth water. @ fayza- yeah, i still have 2 hours worth of drool all over my keyboard from last night. @ tinyhands - okay, maybe not ON the duck pond. but i have a better idea. how about duck ON the sliders? bryan could call it the "bc burger." duck confit (instead of braised shortribs), fois gras, ground beef. wouldn't that be yum? thanks for the kinds words, I'm humbled. question; what kind of camera do you use? its possible, that thing is so big and square it has to finish in a slow oven till hot in the center. Coming out dry means it was in that oven too long and the cheezy goodness boiled out. when you come back in say hello the next one is on me. @ caz- the photos turned out well b/c we sat right by the window for good natural light. i was using a canon powershot A540. if you want any of those photos i give you permission to steal them from me. click on a photo to see the full size version and then save it. uhh, so you didn't like my idea about the duck sliders? damn. Well shoot, guess I'll have to go back and try Reef again. I don't know what's happened to me or why, but on two visits (one lunch and one dinner) I've been terribly disappointed. Each time I've let the waiter suggest the best fish they have that day and also let him decide how the kitchen should prepare it. Each time I've gotten an overcooked piece of wallboard on the same level as Luby's. Looking at the pictures from your dinner, maybe I need to try something besides a simple piece of fish, but damn, isn't that what this is all about?